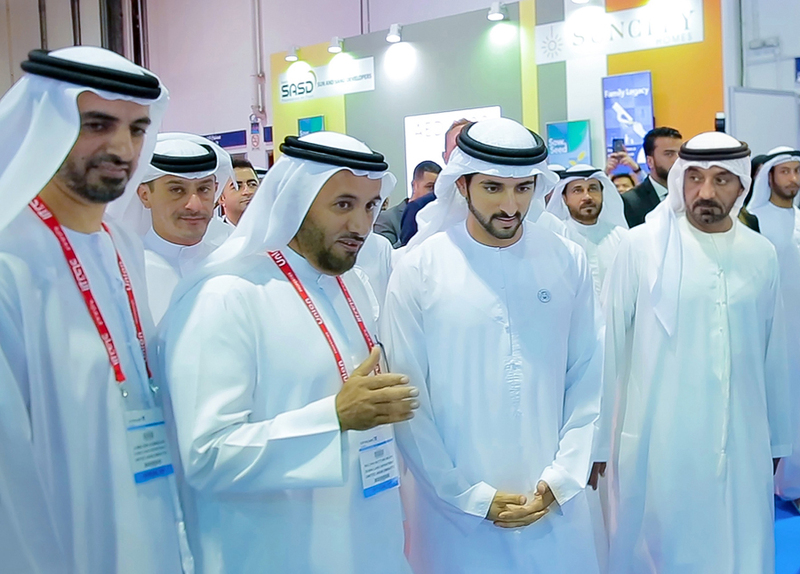 HH Sheikh Hamdan bin Mohammed bin Rashid Al Maktoum, Crown Prince of Dubai and Chairman of the Executive Council of Dubai, visited Dubai Land Department’s (DLD’s) platform on the first day of Cityscape Global 2018, organised by Informa Exhibitions in a strategic partnership with DLD. His Highness was accompanied by HH Sheikh Ahmed Bin Saeed Al Maktoum, President of the Dubai Civil Aviation Authority and CEO and Chairman of the Emirates Group. Their Highnesses were met by HE Sultan Butti bin Mejren, Director General of DLD, who gave them a detailed explanation of ‘DUBAI REST,’ a first-of-its-kind smart platform that provides significant services, most prominent of which is enabling users to verify their properties through facial recognition. Through the development of the smart platform, DLD is eager to align with the vision of HH Sheikh Mohammed bin Rashid Al Maktoum, Vice President and Prime Minister of the UAE and Ruler of Dubai, to consolidate Dubai's position and excellence as the smartest and happiest city in the world. HH Sheikh Hamdan bin Rashid Al Maktoum praised the ‘DUBAI REST’ platform and DLD’s efforts for unlocking a world of smart services. One of the most prominent features of the new smart real estate platform is its access to comprehensive services, such as the provision of complete registration services for rental contracts and rental cases, ‘To Whom It May Concern certificates,’ and other certificates that prove they own properties, as well as real estate valuation applications. DLD confirmed that the new platform will be subject to further development. Upon completion of the second phase, a group of other services will be added for owners, including the possibility to remotely sell real estate and issue a certificate of no objection to investors. Users can see the return on investment by region, type, and use of the property, as well as inquire about real estate projects, the percentage of completion, real estate brokers and their level of performance, and about the values of daily real estate transactions.